We're throwing a party in London to launch our next issue, RP2.04, on Saturday 27 April. Come join! To take an attitude of partisanship towards key struggles of the past does not mean either choosing sides, or seeking to harmonise irreconcilable differences. In such extinct yet still virulent intellectual conflicts, the fundamental contradiction is between history itself and the conceptual apparatus which, seeking to grasp its realities, only succeeds in reproducing their discord within itself in the form of an enigma for thought, an aporia. It is to this aporia that we must hold, which contains within its structure the crux of a history beyond which we have not yet passed. ‘Giving names to periods is difficult’, Turner acknowledges. Nevertheless, to periodise the present as post-postmodern is to surrender the project of historicising cultural production to the same impulses of ahistorical thought that Jameson’s account was meant to displace. To periodise the present through the redoubled application of a prefix marking it as after what was after what came before is not to think history, rupture or negation, but rather to perpetuate a narrative of sequential succession that reduces the past to a terminological prop for the indeterminacy of the present. 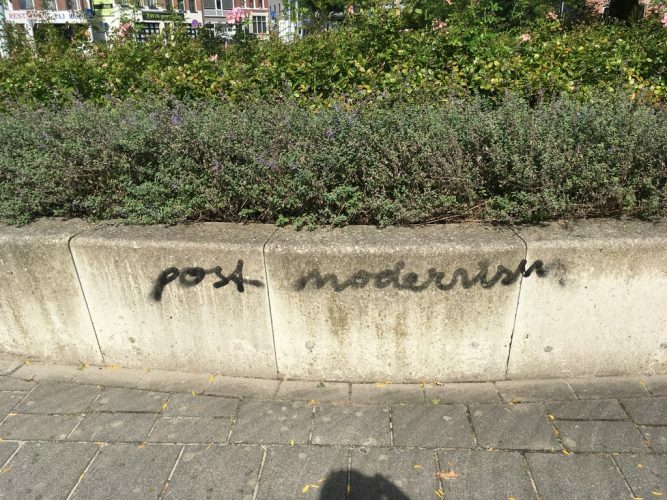 To recognise this is to recognise the same problem with the term ‘postmodern’ itself. Indeed, this problem was among the motives for Jameson’s complex ground-clearing operation, his effort to account for the symptomatic sense of this term while retaining it through critical transformation. Nevertheless, in what follows I will offer a prescription for treating the contemporary impasse of periodisation by diagnosing the symptomatic ambivalence of Jameson’s own pivotal theory of the postmodern; an ambivalence that I think both occludes and implicitly indicates the way toward a coherent understanding of the historical relation between capitalism, modernity and modernism. The remedy I will suggest is a minor terminological shift in our reference to the cultural situation of the late twentieth and early twenty-first century – but one that has major consequences for a historical materialist grasp of what is at stake in the wrenching passage of the present through the crux of the past’s intersection with the future. Thus, the point of my suggestion is not to attempt a belated and opportunistic ‘correction’ of a major thinker and critic; rather, it is to take up the generative contradictions of Jameson’s work in order to pass through the discrepancy between the conjuncture in which it was articulated and our own. The symptomatic ambivalence of Jameson’s account lies in the tension between the ‘post’ and the ‘late’ that it inscribes in the periodisation of ‘postmodernism’ and ‘postmodernity’ as the cultural and historical logic of ‘late capitalism’. Interestingly, Jameson does not refer to ‘postmodernity’ at all in his 1984 essay, but he will tell us in Archaeologies of the Future that ‘the presumption of the existence of something like postmodernity was always based on the evidence of those thoroughgoing modifications of all levels of the system we call late capitalism.’ 7 Thus, while Jameson acknowledges that ‘for Marx modernity is simply capitalism itself’, he periodises late capitalism as posterior to modernity. 8 That is, diverging from Marx’s identification of capitalism and modernity, Jameson wants to hold that capitalism continues in the late twentieth and early twenty-first century, but that it continues after – and enacts, through its ‘thoroughgoing modifications’ – the end of modernity. Indeed, Jameson will refer in his 1991 book to his ‘systematic comparison between the modern and the postmodern moments of capital.’ 9 This putative disjunction between the end of modernity and the continuation of capitalism was always central to Jameson’s intervention in debates about the category of the postmodern. Jameson’s deployment of the term ‘late capitalism’, drawn from Ernest Mandel, was meant to ‘mark its continuity with what preceded it rather than the break, rupture, and mutation that concepts like “postindustrial society” wished to underscore.’ 10 Against the ideological presumption that ‘society’ had somehow moved beyond the contradictions of capitalism, Jameson wanted to underscore the continuity of capitalism under transformed structural conditions – which transformation he thus emphasises by aligning the lateness of contemporary capitalism with a periodising break between the modern and the postmodern. Thus the terminological tension between the ‘late’ and the ‘post’ in Jameson’s account, the condition of being within capitalism but after modernity, constitutes an effort to mark both continuity and rupture, against the notion that everything is different or that nothing has changed. It is in this therapeutic spirit that I want to subject Jameson’s own periodising terminology to this substitution, thus aligning postmodernity with postcapitalism rather than with late capitalism – precisely the alignment he hoped to counter in the 1980s. My methodological model for this ‘experiment’, however, would not be the vulgar sociological obfuscation of the continuing contradictions of capitalist modernity, but rather Marx’s own identification of modernity with capitalism. From this perspective, modernity would necessarily continue throughout the history of capitalism, precisely as the history of its contradictions – the history of what Marx called ‘the moving contradiction’ – while postmodernity could only mark a radically transformed cultural and historical situation after capitalism had well and truly ended. From this perspective, postmodernity is not a fait accompli but a state of affairs to be struggled toward; nor would the end of capitalism be something already achieved, as in the ideological model Jameson attempted to counter, but rather a historical horizon. 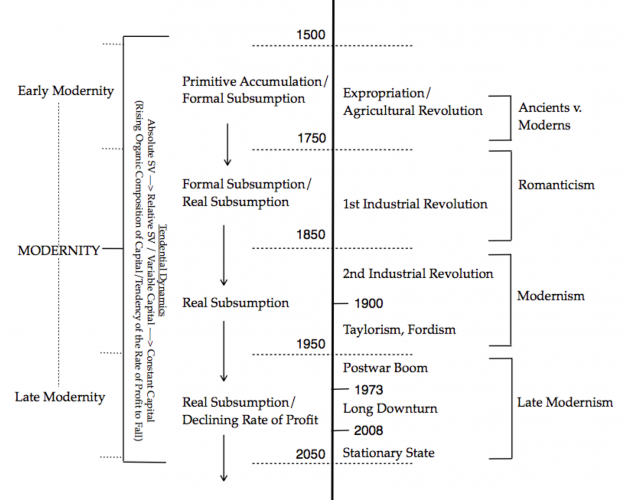 ‘The condition of postmodernity’ would attend the end of capitalism, not its late phase. We can thus condense the political significance of the therapeutic terminological substitution that Jameson himself recommends in a slogan: No Postmodernity Without Postcapitalism! We could condense the periodising significance of this slogan still further: Postmodernity, Not Yet. Perhaps this last parenthetical qualification should give us pause. Can uneven development really have been resolved into absolute synchrony (‘the same hour on the great clock of development’) if one must append the qualification ‘at least from the perspective of the “West”’? Such a claim would seem to implicitly recognise, by delimiting a homogenous occidental perspective, the continuing heterogeneity of ‘development’ that it cancels through the very perspectival delimitation it has to impose. For Jameson, postmodernity can correspond with late capitalism because the latter is a ‘third stage’ during which the ‘fully industrialised’ economy corresponds with the end of uneven development – and thus with the end of modernity, understood as the uneven process of modernisation. Let us dwell for a moment upon the status of Mandel’s account as the sine qua non of Jameson’s periodisation. Jameson values Mandel’s ‘great book’ because it offers a ‘usably Marxian perspective’ on historical periodisation, yet he does not seem very concerned with challenges, on Marxist grounds, to Mandel’s framework. 20 He dismissively refers to ‘the scholastic, I am tempted to say theological, debates on whether the various notions of “late capitalism” are really consistent with Marxism itself.’ 21 If we want to take this question more seriously, we might look to Paul Mattick’s thorough critique of Mandel’s work, published as the final chapter of his 1974 book Economic Crisis and Crisis Theory. In my view, Mattick convincingly shows that Mandel’s analysis is riddled with inconsistencies due to misapplications of Marxist categories, a theory of crisis that over-emphasises relations of supply and demand, and a failure to consistently ground his periodising scheme upon the long-term structural tendencies of capitalist accumulation, rather than a cyclical theory of long-waves and an accompanying stagist logic. In Mattick’s technically refined view (the meticulous articulation of which is perhaps what Jameson dismisses as ‘scholastic’ or ‘theological’), Mandel’s book does not offer a usably Marxist perspective. Far from viewing it as a foundation for further theoretical construction, Mattick finds that ‘it would take a new book to trace Mandel’s inanities in detail if one wanted to show that his work represents not dialectics but ordinary inconsistencies. Perceptive readers of his book will see this for themselves.’ 22 What are the stakes of this divergent assessment, wherein one of the most theoretically perspicuous Marxists of the twentieth century views the same text Jameson hails as a ‘great book’ as an inconsistent compendium of ‘inanities’? What is at issue in Mattick’s stringent critique is the importance of a theoretical framework that consistently approaches relations between secular and cyclical tendencies in the movement of capitalist accumulation by granting explanatory priority to the former, thus grounding an account of the history of modernity in the secular dynamics of capital’s totalising structural contradictions rather than in the expansion of markets, technological revolutions, cyclical fluctuations of profitability or periodic shifts in the relation between supply and demand. The basic point of Mattick’s critique is that Mandel’s stagist theory of the history of capitalism fluctuates inconsistently between orders of explanation while frequently prioritising cyclical over secular dynamics, and this is what allows him to posit three stages characterised by the relation between market dynamics and phases of machine production: first, an era of ‘free competition’, characterised by a ‘relative international immobility of capital’ and correlated with the ‘machine production of steam driven motors’; second, ‘the classical era of imperialism’, characterised by increasingly international concentration of capital and correlated with the ‘machine production of electric and combustion motors’; and, third, ‘late capitalism’, characterised by multinational corporations as a dominant organisational form and correlated with ‘machine production of electronic and nuclear-powered apparatuses’. 23 Rather than a theory of capitalist stages prioritising cyclical dynamics and an order of explanation prioritising markets and technological innovations, what the work of periodisation requires is a unified framework for understanding capital’s secular dynamics, within which the tendential contradictions of accumulation are granted clear explanatory priority and constitute a consistent referent for periodising transitions. In Capital, we already find four periodising terms with which to develop such a framework: primitive accumulation, formal subsumption, real subsumption and the tendency of the rate of profit to fall. In order to understand and to mobilise the relationship between these terms and their periodising logic, however, we have to relate them to distinctions Marx draws, within the process of valorisation, between two kinds of surplus value and two kinds of capital: absolute surplus value and relative surplus value; constant capital and variable capital. The utility of primitive accumulation, formal subsumption, real subsumption and the tendency of the rate of profit to fall as periodising categories is that they cannot be understood otherwise than through the relational integration of these Marxist categories. That is, to ground a periodising schema in these categories requires us to remain at all times within the framework of Marx’s theory of valorisation and accumulation. It is through the interrelation of these categories, delineating the structure of capitalist accumulation as a moving contradiction, that one can explain the political-economic causes of the first and second industrial revolution, the integration of Taylorist management and assembly line labour into the process of production, the movement from the postwar manufacturing boom to tendential deindustrialisation and financialisation, the long downturn in profit rates since the 1970s, and the continuing stagnation of economic growth following the 2008 crash. The graph of my own periodisation accompanying this essay organises these phenomena according to their relation to overlapping phases of primitive accumulation, formal subsumption, real subsumption and tendentially declining profit rates. It is intended as a flexible guide and summation of the periodising structure for which I argue in what follows. Let me approach an explanation of this periodising framework with two questions. What is Mandel talking about when he refers to ‘the period in which all branches of the economy are fully industrialised for the first time’? And what is Jameson talking about when he describes the completion of the ‘modernization’ process? They are talking about the achievement of what Marx calls ‘real subsumption’: the achievement of a properly capitalist process of production through the subsumption not only of relations of production but also the process of production under capitalist social and productive relations. But what is ‘a properly capitalist process of production’? It is one that is thoroughly reorganised through the exigencies of capitalist competition to produce the greatest volume of relative surplus value, in addition to absolute surplus value. Yet this fundamental Marxist distinction between relative and absolute surplus value – to which Marx’s understanding of the history of capitalist accumulation and his periodising terminology is so intimately related – does not play a major role in Mandel’s account and is nowhere to be found in Jameson. Briefly, the expanded production of absolute surplus value is predicated upon lengthening the working day and lowering wages. There are obvious limits to these measures, since workers have to reproduce their labour power. These limits are addressed through the expanded production of relative surplus value, predicated upon the reduction of necessary labour time (the time required to reproduce the value of the worker’s daily wage) in relation to the length of the working day. Such a reduction requires managerial and technological innovations: alterations of the process of production itself (real subsumption) in addition to the subsumption of pre-capitalist productive processes under capitalist social relations (formal subsumption). It is limits to the expanding production of absolute surplus value and competition over the maximal production of relative surplus value that drives capitalist technological innovation, the capitalist division of labour, the introduction of new management techniques, and the coordination of all of these through synthetic technical / managerial apparatuses like the assembly line. Moreover, it is competition over the production of relative surplus value (in addition to absolute surplus value) that increases investment in constant capital (plant, equipment, materials) and decreases investment in variable capital (wages). As Marx shows, this pattern of relatively increasing investment in constant capital (‘the rising organic composition of capital’) entails two secular trends that are fundamental to understanding the historicity of capitalism: 1. the tendentially increasing production of surplus populations resulting from diminished access to the wage (variable capital); 2. the tendency of the rate of profit to fall, since surplus value is ultimately drawn only from investment in variable capital, which (relative to investment in constant capital) tendentially decreases according to the exigencies of capitalist competition, which require the maximal reduction of necessary labour time (increased productivity). When Jameson wrote his foundational article on ‘postmodernism’, the conjunctural importance of Mandel’s Late Capitalism as a critical intervention against theories of ‘post-industrial society’ made it indispensable for his effort to apply Marxist historiography to the postmodernism debates. Its conjunctural utility in those debates also made it opportune to dismiss Marxological critiques of Mandel as ‘scholastic’ or ‘theological’, since a thinker like Mattick, however acute, did not offer a ready periodising framework within which to situate cultural production since the 1960s. Today, however, we have at our disposal Robert Brenner’s persuasive periodisation of the postwar and contemporary period, informed by decades of hindsight since Mandel’s 1972 intervention. Mandel’s book was poised on the brink of the crisis of 1973 and thus in no position to situate the postwar period with respect to the forty year decline in profit rates that would follow from it, as does Brenner’s lucid account of the relationship between the manufacturing boom of 1945-1965 and the subsequent ‘long downturn’, continuing into the present. 27 We should note that, contra Jameson, the dynamics of continuing uneven development are central to Brenner’s account. Moreover, we now also have, among other works, an important periodisation of the link between the changing structure of the class relation and cycles of communist struggle by Théorie Communiste, developed since the 1970s; 28 the work of the journal Endnotes on deindustrialisation, tendentially rising surplus populations and the logic of gender and racialisation during the long downturn; 29 and a suggestive speculative account of the prospective ‘stationary state’ of stagnating growth following from the crash of 2008 by Gopal Balakrishnan. 30 These are rigorously Marxist accounts of economic and political history that might help us to revise our periodisation of the late twentieth and early twenty-first century in accordance with what we know now, rather than what we knew in 1972 or 1984. Thus we can also situate Jameson’s theory of ‘postmodernism’ within this revised context, placing it within its conjunctural limits rather than continuing to take it at face value as a theory determinate of our periodising horizons in the present. What all of these accounts (Brenner, Théorie Communiste, Endnotes, Balakrishnan) have in common is a commitment to grounding periodisation first and foremost in the secular dynamics of accumulation, rather than in cyclical phenomena or technological ruptures. These accounts are already integrally related, as Balakrishnan relies upon Brenner’s account of the long downturn, while Endnotes synthesises Brenner’s account of economic history with Théorie Communiste’s periodisation of the class relation and cycles of struggle, developing a political-economic account of capitalist dynamics and contemporary struggles that is also broadly consistent with Balakrishnan’s speculative prospectus on the ‘stationary state’. I would argue that the high degree of relational consistency between these accounts can also be articulated through the periodising categories of primitive accumulation, formal subsumption, real subsumption and the secular tendency of the rate of profit to fall. Brenner’s theory of agrarian class structure and economic development in early modern Europe gives us an account of primitive accumulation and formal subsumption upon which his later work is grounded, while this later work gives us a history of structural contradictions that follow from the achievement of real subsumption. Théorie Communiste gives us a periodisation of formal and real subsumption in relation to the structure of the class relation, and we can read and adjust their periodisation in relation to recent work on this question within the communisation current. 31 Endnotes gives us an account of the effect of the long downturn upon class composition and the tendentially increasing exteriority of proletarians to the wage, while attending to the relationship between real subsumption and unwaged reproductive labour, as well as to links between racialisation, carceral labour and state violence in a time of declining industrial profitability. Balakrishnan diagnoses the limits upon future growth imposed by the structural impossibility of returning to the tendentially rising production of relative surplus value after the accomplishment of real subsumption in the nineteenth and twentieth century. I want to emphasise that these accounts, reconstructed and related in these terms, offer us a contemporary understanding not only of the structure of capitalist contradictions but of their history. They offer us the framework for understanding the continuing history of modernity as the history of capitalism: of transformations of the class relation, of the process of production, of gender and racialisation as social relations, of the changing horizons of class struggle. Most importantly, they allow us to see that, although the process of real subsumption is accomplished by the 1960s (as is evident from globally tendential deindustrialisation 32), the history of modernity continues as the movement of the same structural contradictions that necessitate the accomplishment of real subsumption in the first place. One sign that the accomplishment of real subsumption does not signal a radical break with the history of modernity is that the period of declining profitability following from it is attended by profit-seeking through the renewed expansion of absolute surplus value production, through the offshoring of manufacturing labour to zones where labour regulations do not prohibit longer working days and lower wages. We do not exit modernity into a fully modernised world in which uneven development is eliminated, but we do enter into a late phase of modernity, correlated with a late phase of capitalism, during which the social and political consequences of real subsumption play out. Modernity is structured as the history of the contradictions of capitalist accumulation, and as long as those contradictions persist across and through discrepant phases, so, too, does the history of modernity continue to unfold as the history of capital. It is crucial, to note a particularly pressing contemporary example, not to understand global warming in terms of the ‘disappearance’ of nature but rather in terms of the persistence of its unpredictable relation to the history of accumulation and the class relation (i.e., not ‘everything is now organized and planned’). 33 It is politically important to understand the neo-slavery of the American carceral state as part of the history of modernity, included within its social logic, rather than as posterior to it. It matters that we recognise the tendentially increasing production of surplus populations as every bit as fundamental to the socio-historical dynamics of modernity as the initial subsumption of the peasantry under the wage and the concomitant process of urbanisation. We can only grasp the history of modernity through the moving contradiction of capitalist accumulation if we are willing to think the structural determinations of that history through to the end of capital’s tumultuous dynamics, rather than cancelling the history of modernity as it moves into a late phase characterised by the achievement of real subsumption: a phase which, we must note, Marx had already predicted within the same historical conjuncture in which he identified modernity with capitalism. The consequences of real subsumption are as much a part of modernity as the process of real subsumption itself, precisely because both result from and inhere within the history of capitalism. While taking seriously the importance of Mattick’s critique of Mandel, I will thus retain ‘late capitalism’ as a periodising term, correlating it with ‘late modernity’ in order to mark the achievement of the process of real subsumption during the postwar period and the movement thereafter into the long period of declining profitability theorised by Brenner. This is indeed a ‘late’ phase of capitalism, during which the dynamic accumulation enabled by the expanded production of relative surplus value tendentially declines. This is also a ‘late’ phase of modernity, during which the modern growth of the industrial proletariat and the technological dynamism of a transformed process of production traverses the arc of real subsumption and passes into a period of relative decline and stagnation, thus transforming the social dynamics and lived class structure of recent history without thereby breaking its continuity with the structural determinations that brought us to this point. Indeed, the continuing legibility of those structural determinations depends upon our capacity to situate them within the continuing history of modernity, rather than as a radical break with or termination of the latter. 34 Just as the long period we refer to as ‘early modern’ involved a gradual movement toward the onset of real subsumption, ‘late modernity’ is characterised by the unfolding of the consequences of real subsumption, grasped as the deepening of capitalist contradictions and their irreversible dynamics. Again, in order to think modernity as the history of capital – and not as a process of modernisation abstracted from capital’s contradictions – we have to continue to think modernity as the history of capitalism as long as the latter exists. How then does this adjustment of our periodising terms bear upon the relation between modernism and modernity? Clearly, modernism is neither coeval nor coextensive with modernity. Whereas Jameson frequently equivocates between ‘modernism’ and ‘modernity’ and ‘the modern’, we must clearly distinguish the former as a discrete period of cultural production within the larger history of modernity. What then distinguishes this period of cultural production according to the structural account offered here? Why does it become a cultural dominant at a particular moment in capitalist modernity? My answer aims not at originality, but rather specificity and consistency: modernism is the cultural logic of real subsumption. From the first cultural configurations reflexively addressed to modernity – the quarrel between the ancients and the moderns – we move through a romantic period characterised by a transitional subsumption of social relations and the process of production under capitalism: a transitional movement from formal to real subsumption that persists through the first industrial revolution. Modernism is then the apogee of culture’s reflexive attunement to modernity, and it is proper to a period in which real subsumption is fully underway (ca. 1850-1950): in which the capitalist process of production is integrally transformed by the competitive necessity of expanded relative surplus value production. This involves all sorts of contradictory dynamics, such as the colonial extraction of raw materials for industrial production driving the nineteenth-century scramble for Africa. Thus futurism and primitivism flourish at the same time: the muddy water of the factory drain into which his racing automobile plunges can recall for Marinetti the breast of his Sudanese nurse; Baudelaire, amid his reflections upon the transformation of Paris, will ‘think of the Negress, gaunt and consumptive / Trudging in sludge, and seeking, eyes haggard, / The absent palms of splendid Africa’; 35 the Dadaists can style themselves as skyscraper primitives. Modernism takes its course when it does because it is not the cultural logic of primitive accumulation nor of formal subsumption but of their collision with and integration into full-blown real subsumption, the cultural registration and inscription of modernity at the crest of its contradictions. Jameson will eventually elaborate a category of ‘late modernism’ to designate cultural production from 1945 to the 1960s as ‘a product of the Cold War’. 36 What I propose is that we disentangle the periodising reference of this term from its relatively superficial attachment to the Cold War and extend it to encompass cultural production into the present. What is at stake in this adjustment is the recognition that the constitutive relation of contemporary cultural production to modernism continues to structure the art market (perhaps most importantly), as well as the formal innovations of twenty-first century literature and architecture. Jameson characterises the cultural-historical situation of ‘postmodernism’ as one in which modernist styles have become postmodernist codes. 37 My sense is that this is now also true of the relation of twenty-first-century cultural production to the ‘postmodern’ codes gleaned from modernist styles: they too now serve as a system of referents for discrepant transformations. If this is so, it is because we have remained, throughout, within a late phase of modernism itself, a phase in which the new continues to have become old while the abolition of the economic and cultural imperative of novelty has not yet been traversed. Clearly, we are not there yet. I concur entirely with Anderson’s last sentence: the end of capitalism must also be the end of modernity, of the structural determination of history and culture by the contradictions of capitalism. Yet I do not agree with Anderson’s assessment, just prior to this passage, of ‘modernism’ as ‘the emptiest of all cultural categories’. 39 Modernism is a valuable category precisely because it is capable of including both the primacy of the new and its structural relation to ‘what comes later’: it names the structural contradiction between the new and the late that Anderson expounds and that he views as expressive of capitalism’s ‘temporal vanities’. Modernism does indeed name ‘the axes of aesthetic life’ which could now only be abolished by the abolition of capitalism – and these have not yet been abolished. To speak of ‘late modernism’ as the cultural logic of late capitalism, as the culture of late modernity, is to recognise that once we have passed over the crest of real subsumption its effects upon both capitalist economics and capitalist culture (and thus anti-capitalist culture) are irreversible, and we are still within them. The term ‘late’ designates this condition of being after-yet-within; it acknowledges the ambivalence of the not yet, and it demarcates the extension of a horizon that we still have to pass beyond. ‘Postmodernism’ and ‘postmodernity’ are among the dominant ideologies of late capitalism. In this sense, Jameson’s diagnosis was correct. But when he extends his diagnosis to the affirmation of a veritable historical period designated by the term ‘postmodernity’ he goes awry. The desire to be postmodern, in history and in culture, expresses a desire to have already passed through the wrenching historical crux that, as Anderson notes (and it is still true today), we have not yet passed through. It is thus not too late to adjust Jameson’s periodisation to bring it into line with the conjunctural demand he tried to meet: to align cultural production with the cultural logic of late capitalism, rather than with the presumption of a post-capitalist epoch. Here I can only briefly elaborate some consequences of this realignment for our understanding and characterisation of cultural production. 40 My concern in this respect is not to quibble with the traits of what Jameson considered the cultural dominant of the late 1960s, ‘70s and ‘80s. Indeed, Jameson’s empirical description of those aesthetic phenomena he called ‘postmodernist’ seems to me lucid enough. I have no particular quarrel with his assessment of Andy Warhol’s Diamond Dust Shoes or its relation to Van Gogh’s A Pair of Boots (though the selection of the latter as a representative of modernist painting indicates the strain of imposing a sharp enough periodising break to warrant the term ‘postmodernism’). Likewise, Jameson’s description of the Wells Fargo Centre and the Bonaventure Hotel in Los Angeles still seem plausible enough, even after thirty years of hindsight (although the former seems to me a late incarnation of suprematist architecture). These pages in his famous essay remain among the high points of cultural criticism in the 1980s. Rather, my concern is to ask after what else might come into view during that period from a revised periodising perspective, and to consider how the shift in perspective I have proposed might enable us to grasp the relationship between cultural production in that period and in the present. Jameson highlights William Gibson’s 1984 novel Neuromancer as a paradigmatic exemplar of the relationship between sci-fi and the structural conditioning of culture by capitalism during the upsurge of financialisation in the 1980s. 41 For Jameson, science fiction is the literary organon of our incapacity to imagine the breakdown of capitalism. His argument is that ‘SF does not seriously attempt to imagine the “real” future of our social system. Rather, its multiple mock futures serve the quite different function of transforming our own present into the determinate past of something yet to come.’ What is authentic about science fiction, Jameson argues, ‘is not at all its capacity to keep the future alive, even in imagination. On the contrary, its deepest vocation is over and over again to demonstrate and to dramatise our incapacity to image the future, to body forth, through apparently full representations which prove on closer inspection to be structurally and constitutively impoverished, the atrophy in our time of what Marcuse has called the utopian imagination.’ 42 In this mode, Neuromancer involves a technological extrapolation of the late capitalist future from the late capitalist present, and also a re-entry of that imagined future into a displaced rendering of the present to which we cannot imagine an outside. To be sure, this operation makes a great deal of sense within the periodising lens of ‘postmodernism’, through which the world can only become more and more postmodern (as evidenced by the term ‘post-postmodern’ or by Jameson’s use of the term ‘full postmodernity’ in the late 1990s). 43 Yet my sense is that the substitution of the term late modernity for postmodernity, and the shift in perspective this entails, opens a more lucid perspective upon Jameson’s famous claim that ‘it seems easier for us to imagine the thoroughgoing deterioration of the earth and of nature than the breakdown of late capitalism.’ We can affirm that Jameson is correct – but this is because postmodernity is exactly what we do not yet know, not because we are already situated within it. What sort of grappling with the lateness of modernity might be obscured by the presumption that we are already beyond it? Despite his evocation of the ‘inverted millenarianism’, the ‘sense of an ending’ proper to postmodernism, 46 it is difficult to make much sense of a novel like Blood Meridian through Jameson’s characterisation of postmodernism as a cultural dominant. His pursuit of simulacra, leaning heavily upon Baudrillard, is oriented toward superficial depthlessness, the waning of affect, the complexity of the global system and network culture. Of course, all of this has its crucial place: precisely at the surface of late modern culture. But when and if we recognise that by the mid-1980s we are also already within the midst of the long downturn, that the development of information technology and the turn to financialisation are predicated upon the same dynamic as the tendency of the rate of profit to fall, upon the downward momentum of capital, then we might be more inclined to turn toward a novelist like McCarthy than to Gibson: that is, toward a novelist who narrates the nihilistic drift of Evening Redness in the West. But more precisely, what matters is to recognise the relationship between these two period styles, the tension between them, as crucial to the cultural logic of late capitalism, and to recognise that tension as indicative of a late (rather than post) modernity. Consider, amid more recent fiction, Rachel Kushner’s widely read 2013 novel The Flamethrowers. Here we have a narrative that moves between the speed culture of Italian futurism, Fiat industrialism and its harvesting of rubber from Latin America, the radical politics of the Italian movement of ’77 and the Red Brigades, and the New York art world of the 1970s. We are immersed in the contradictions of real subsumption as we move from the technophilic, fascist aestheticisation of politics in the early twentieth century, to the development of ‘Fordist’ manufacturing, to the fallout of its declining profitability and rising class conflict in the 1960s and ‘70s, all the while shadowed by the abstractions and career moves of an art world that seems to double, displace and integrate both capitalist logics and anti-capitalist energies. Kushner’s book is of particular interest as a canny, implicit commentary on the upsurge of radical political movements during the period of its composition, following the 2008 economic crash and thus shadowing political movements after the crash of 1973. Thus we are drawn into a concatenated history of the twentieth century and the persistence of its contradictions into the twenty-first, absorbing and articulating the cultural resonance of real subsumption from its futurist moment to its results in the inception of the long downturn and the consequences of the latter in the present. We are invited to consider this as one trajectory, complex though it is, traversing the last one hundred years, following the movement of modernism, at the crux of modernity, to a present moment that is not yet beyond its structural and cultural exigencies. Turning to Claudia Rankine’s 2014 book Citizen: An American Lyric, a harrowing anthropology of quotidian white supremacy and anti-Black racism, we might ask ourselves how it is possible to understand such a text through a periodising lens situating us after modernity. Here we are grappling with the ongoing history of slavery in the United States, with ‘the vexed genealogy of freedom’ as ‘burdened individuality’ analysed by Saidiya Hartman in Scenes of Subjection, and thus with the persistence of the contradictory logic of modern liberalism in the present. 47 Does it not depoliticise the relation of this logic to the history of modernity to periodise in such a way that we situate ourselves after that history, rather than remaining within it? In Rankine’s book, techniques of collage and documentary reportage we might associate with such modernist texts as Muriel Rukeyser’s Book of the Dead or Charles Reznikoff’s Testimony are inflected with a tone of belated exhaustion that amplifies, via the mood of the text’s formal history, the ongoing burden and exasperation of Black positionality that the content of the book conveys. The cutting irony and accuracy of the book’s subtitle, An American Lyric, relies upon the relationship of modernist anti-lyric to romantic lyric, and upon the contradiction between these, as itself a form of self-expression that is both thwarted and necessitated by the history of modernity and its cultural forms. This is a late modernist lyric, wherein modernist form persists as at once exhausted and renewed, and it belongs to a period of late modernity in which the political and social framework of anti-Black racism continues to play a constitutive role in regulating everyday life and policing the racialised inequalities of capitalist exploitation. Finally, if I had to choose a single exemplar of the periodising congruence of late capitalism, late modernity and late modernism it would be Roberto Bolaño’s 2666. Returning us to the border lands of Blood Meridian from the other side of their history, and now some 150 years after the Mexican-American war and the western migration of the Gold Rush, Bolaño places at the center of his novel the brutal killings of women on the peripheral waste spaces of the maquiladoras, factories sprouting like flowers of evil from NAFTA’s tariff-free manufacturing zones. 48 The maquiladoras are there because uneven development persists; yet both the possibility and necessity of relocating American manufacturing indicates that real subsumption has already happened. The novel’s final section moves from 1902 through the Holocaust and back to Mexico, thus inscribing Mexico’s recent history in the record of twentieth-century catastrophe. Yet the novel has already, before this final section, inscribed the longer history of modernity within the killing fields of 1990s Juarez, through its technically complex, tonally dispassionate, and thus all the more wrenching evocation of the structural causality of capitalist violence. Formally, what is notable about Bolaño’s book is its fusion of surrealist free indirect style and picaresque episode with social realism and documentary reportage. Like Pynchon, Bolaño has no trouble straddling the ‘realism-modernism’ debate that has been so central to Marxist literary criticism. One of the implications of my argument about the correspondence of modernism to the central phase of real subsumption during modernity (ca. 1850-1950) is that realism is not properly understood as a periodising category. With Courbet, we can say that realism is the death of romanticism, and that at the same stroke it is, in its self-recognition as an -ism, the birth of modernism, as in the pivotal case of Madame Bovary. Lukács can deploy Mann against Joyce because the realism-modernism debate is in fact a debate internal to modernism, a debate between modernist ‘-isms’ that only makes sense on its original terms: expressionism versus realism or surrealism versus realism. The formal accomplishment of writers like Pynchon and Bolaño is to hold together, dialectically, the contradiction of these methods within a single form. In this respect they do not displace but rather carry on the legacy of modernism by holding together its contraries within an integral yet internally discrepant style of narration capable of making realism adequate to the contradictions of modernity, and thus of making modernism adequate to its own contradictions. It is from Jameson’s commentary upon the so-called ‘realism-modernism’ debate in the influential Aesthetics and Politics collection, originally published by New Left Books, that I have drawn my epigraph for this essay. There he tells us that ‘in such extinct yet still virulent intellectual conflicts’, the contradiction is between history and the conceptual apparatus that seeks to grasp it while actually reproducing the discord of those conflicts in the form an aporia, ‘which contains within its structure the crux of a history beyond which we have not yet passed.’ 49 It is in the spirit of attempting to hold to such an aporia that I have found it necessary to return to the now antiquated postmodernism debate, in order to reconfigure its conceptual apparatus on the basis of what has become structurally and historically legible since it took place. What’s in a name, one might wonder? But it is a matter of no little consequence – politically, historically, and culturally – to decide whether or not modernity is over. If neither modernism nor modernity are behind us, if modernity remains the history of capitalism and if the belated reproduction, renewal and critique of modernist forms still characterises the present, such that the history of their contradictions has not yet passed, then it behoves us to hold our periodising categories accountable to their persistence.